Sardinia is an Italian island in the heart of the western Mediterranean sea between the North African and the Italian mainland. 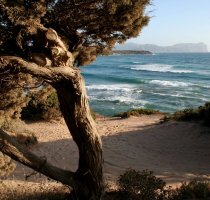 Hotels in Sardinia Long isolated, Sardinia has deeply preserved its own character, landscape and traditions. Being the centre of the island predominantly hilly and mountainous, with a few coastal plains, the Sardinian coast has an incredible stretch of almost 2,000 Km of unspoiled landscape from north to south, where rugged cliffs and tiny coves alternate with miles of long, white sandy beaches. Such beaches are among the world's most enchanting ones and here the seawater is gifted with aquamarine and emerald green shades. Thanks to its long seclusion and a reasonably low population density, Sardinia has preserved its spellbinding beauty, combining the scents and colours of oleander, juniper and myrtle bush with the most pristine and translucent sea water. Undiscovered, somehow secluded and with such a natural outstanding frame, Sardinia plays an undisputed top of the list role among the most beautiful places in the Mediterranean. Sea and suntan lovers will enjoy Sardinia any time between April and October; June, July and August are the hottest months with an average temperature of 30° Celsius, although the coastal areas are often swept by a cool breeze. Any time of the year is recommended for golfers, hikers, climbers and those willing to explore the mountainous area of the island. Although invaded and dominated several times across the centuries, Sardinia mainly preserves the artefacts and ruins of the Nuragic people, a prehistoric population that first settled there. All over the island there are about 8,000 nuraghe, the main type of megalithic edifice found in Sardinia with its typical shape of a truncated conical tower, thought to have been built between the 18th and the 15th century BC. 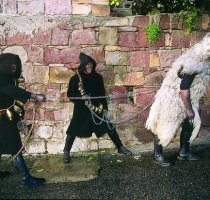 Today it has come to be the symbol of Sardinia and its distinctive culture. The settlement of Su Nuraxi in Barumini is a UNESCO World Heritage Site. Hotels in Sardinia Sardinia is accessible from all over Europe by scheduled and charter flights. There are three main airports: Cagliari-Elmas airport (CAG) in South Sardinia, Alghero-Fertilia airport (AHO) and Olbia-Costa Smeralda airport (OLB) in North Sardinia. The latter being the nearest airport to reach Centre Sardinia. From the Italian mainland there are also several daily ferry connections arriving at Cagliari, Olbia, Porto Torres and Arbatax seaports.